* Career Quest is dedicated for Interview Training since 2009. 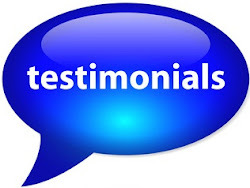 * Career Quest is most trusted for Govt job interview training with 1321+ selections. 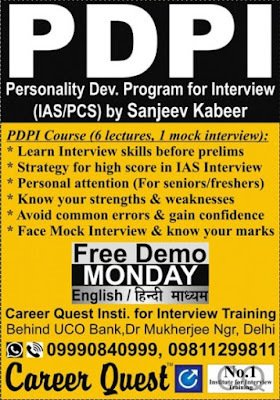 * PDPI course guides you for IAS/PCS Interview preparation well in advance - before your UPSC prelims and mains examination. * Long term Interview preparation strategy gives you enough time to improve your personality and presentation skills. * With right approach, one can avoid last minute anxiety for IAS interview. * Lecture 1: Introduction to Interview process & purpose, long term preparation strategy. * Lecture 2: Presentation skills, common errors, mannerism, communication skill. * Lecture 3: Biodata/DAF related questions like hobbies, gap, home state, graduation etc. * Lecture 5: Interaction with topper and query session with Kabeer sir. # Enroll for first FREE lecture. Phone/WhatsApp: 09811299811, 0999 0840 999.